The results are in! 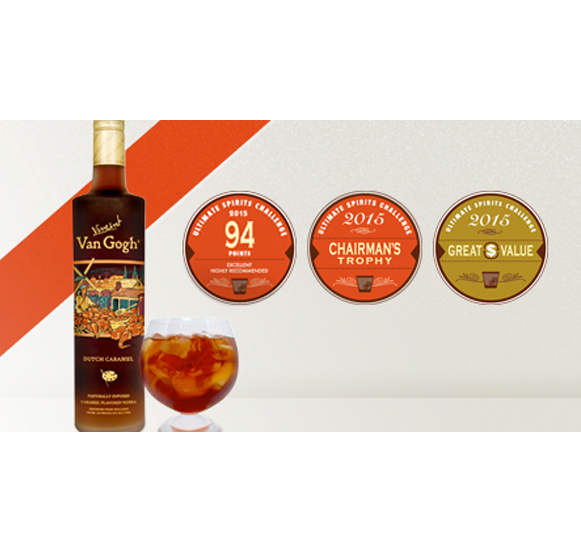 Van Gogh Vodka received multiple awards in the 2015 Ultimate Spirits Challenge, one of the most prestigious spirits competitions in the country. Van Gogh Blue Triple Wheat and Van Gogh Double Espresso were named finalists, representing the best in their individual category. Van Gogh Gin received 93 points and Van Gogh Cool Peach Vodka was given a strong recommendation. The Ultimate Sprits Challenge is highly regarded in the spirits industry by its critically acclaimed judges. In addition to F. Paul Pacult, the USC judges included: Sue Woodley (Ultimate Beverage Challenge partner); Andy Seymour; Dan Nicolaescu; Jennifer Simonetti-Bryan, MW; Will Shine; Tad Carducci; Sean Ludford (Judging Co-Chairman); Dale DeGroff; and David Talbot (UBC partner). See below for a full review of each product. For the full list of winners, visit: http://bit.ly/1vGU3US.